I am so happy that today I get to join in the book tour for the new release, Good Night, Captain Mama (affiliate link). Appropriate, no? There are not many (are there any?) books about Latinas in the military. So this ground-breaking bilingual book is a special treat for not only military families, but also for the Latino community as a whole. Our girls need to be empowered to be the captains of their own lives, and this book is a great tool for teaching them to do so. Good Night, Captain Mama/Buenas noches, Capitán Mamá is lovely story about a young boy and his mother, who happens to serve in the U.S. Air Force. One night as she gets ready to leave for work, this military mami patiently answers all her son's questions. Marco wants to know all about what his mother does at work and what the patches on her uniform represent. His mami uses the patches to help him - and the reader! - understand what it is like to serve in the U.S. Airforce. I really like how in the back of the book, you can find a blank template that you can copy/print and have your child create their own unique patches. The illustrations are exceptional and enrich the story line very well. Linda Lens does an amazing job of capturing the details of the patches and military equipment, as well as expressing the tenderness between the mother and her son. It looks to me like she's used colored pencil, which is another neat aspect of the book...at least for my own art-loving children. Parents can continue the lesson after reading the book by visiting Captain Mama's website, where they'll find additional photos and other resources. 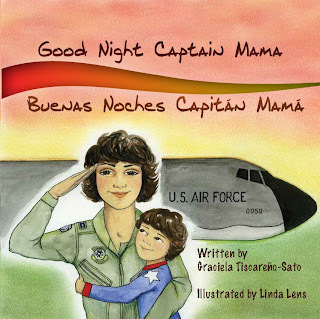 Inspired by her own son, the book was written by former military pilot and instructor, Captain Graciela Tiscareño-Sato. During her active duty military career, she lived on four continents and received many medals for her work in the air and on the ground. Already Good Night, Captain Mama has made it onto Amazon's Best-Seller List (under Children's Latino & Military) and Hot New Releases lists! 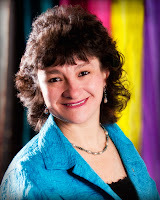 If you'd like to get an author-signed copy, visit Graciela's site, www.captainmama.com. While supplies last, for every book ordered at that site, you’ll receive a military-style embroidered patch of the book’s cover art. Amazon buyers who send their order receipt to info@gracefullyglobal.com will also receive patches. And if you need yet another good reason to buy this book, you should know that a portion of all sales will be donated to V-WISE (Veteran Women Igniting the Spirit of Entrepreneurship), a training program operated by the Institute for Veterans and Military Families at Syracuse University, which educates and mentors women veterans through entrepreneurship to pursue self-employment as a post-service career. For mamis and papis who are looking for a book that encourages and inspires their children - and especially their girls - to follow their dreams, this is the perfect book for you. I love how it honors the loyalty and bravery of our women serving in the U.S. military.